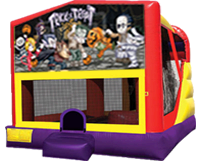 Trick or Treat 4n1 Combo Bounce House WET is perfect fro that Halloween Party while the water is still a little warm or can be rented dry. In this 4n1 Combo, there is a good sized jumpy area with a basketball hoop inside. Parents love this unit because the slide is inside the unit so the kids don’t have to get out of the Bounce House and get back in again. Check out our Dry Slides and Combosalso.